Bishop Union High School baseball and softball hit the road Tuesday starting the final week of High Desert League play. The Bronco baseball team won a slug-fest 20-8 while the varsity softball team fell 11-9. Bishop Union will now wrap up the regular season with a Thursday trip to rival Kern Valley. The Bishop bats came alive at Fraizer mt pounding out 18 hits. Sophomore Lorenzo Parra provided the biggest blast launching a 3-run homerun in the 7-run third inning. Freshman Michael Kubiak had a special day reaching base six times and scoring 5 runs. Kubiak set the tone for the big offensive day with a lead off triple. Bishop Union improves to 4-3 in High Desert league play and can tie Kern Valley for runner up with a road win Thursday. Rosamond has secured the HDL title at 7-0. The varsity game will be broadcast live on AM 1230 KBOV and streamed live here at kibskbov.com through the listen live link. Justin Yates, 4 innings pitched, 8 runs, 9 hits, 5 strikeouts. Cal Omohundro, 1 inning pitched, 0 runs, 1 hit, 2 strikeouts. Zack DeLeo, 1 inning pitched, 0 runs, 1 hit, 3 strikeouts. Michael Kubiak, 2 for 3, double, triple, 3 walks, 3 RBI, 5 runs. Brodie Maloney, 3 for 5, single, 2 doubles, walk, 4 RBI, 2 runs. Zack DeLeo, 3 for 5, 2 singles, double, walk, 2 RBI, 3 runs. Lorenzo Parra, 2 for 4, single, homerun, hit by pitch, 3 RBI, 2 runs. Cal Omohundro, 3 for 3, 3 singles, 2 RBI, 2 walks, 2 runs. Joe Mayhugh, 3 for 4, 3 singles, walk, 2 RBI, 2 runs. Chance Womack, Sacrifice bunt, walk, run. Peyton Wagoner, 1 for 2, single, walk, 2 runs. Justin Yates, walk, run, RBI. Aaron Chinzi, 1 for 3, sacrifice fly, double, 2 RBI. Little Eva Lent, 4 and 1/3 innings pitched, 9 runs, 5hits, 5 K’s, 5 BB’s. Peyton Tetrick, 1 and 2/3 innings pitched, 2 runs, 1 hit, 0 K’s, 0 BB’s. Bailee Piper, 1 for 4, homerun with 3 RBI. Destiny Frank, 2 for 3. Topah Scherer, 2 for 3. Ashley Worley, 1 for 3 with 1 RBI. Sabrina Barlow, 1 for 3 with 2 RBI. Peyton Tetrick, 1 for 3. Hannah Waasdorp, 1 for 4. Gracie Soto, Corie Campbell, Jenna Andersen, Selia Amisone and Cassidy Moffett had multi-hit games. The Bronco JV boys can win the High Desert League title outright with a win over Kern Valley Thursday. 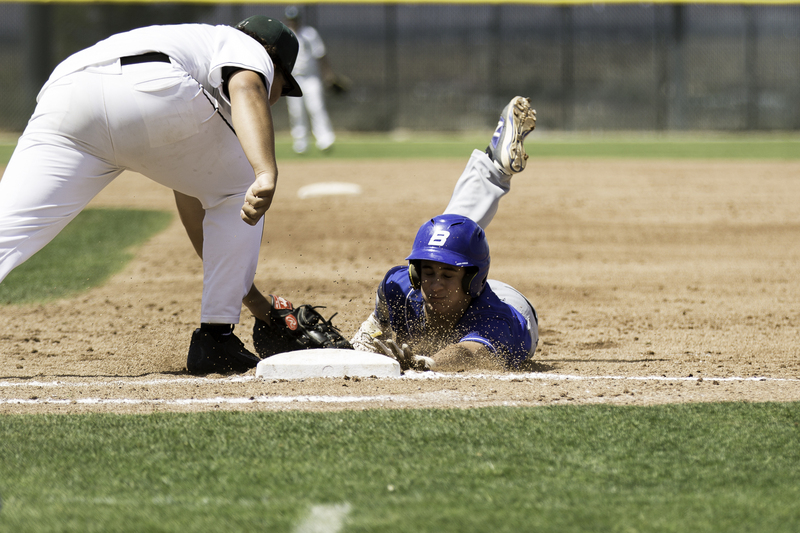 Cover Photo, Lorenzo Parra hit by pitch vs California City. Photo by Lorenzo Parra Sr.
Friday’s High Desert league home opening ball games began with sunshine and closed with wind and rain. Bishop Union High School’s baseball and softball teams excelled in all weather conditions sweeping Frazier Mt. The varsity boys and junior varsity girls put their games out of reach early with the varsity girls winning in walk off fashion. The JV boys had the day off as Frazier Mt is not fielding a JV squad. This week is a big one for the Broncos as they continue their home stand hosting rival Kern Valley Tuesday and Rosamond Friday. The Varsity boys games are broadcast live on AM 1230 KBOV and streamed live here through the listen live link. In the bottom of the 1st inning Bishop Union lead off man Patrick Mitton failed to reach 1st base, however the next 14 Broncos (including Mitton in his 2nd at bat) reached first base…all 14 scored. By the time the Friday sun was covered by rain clouds the Broncos scored 16 runs on 10 hits. Bishop Union added 4 runs in the 2nd inning, a pair in the 3rd and 4 more in the 4th. Patrick Mitton, 2 innings pitched, 1 run, 0 hits, 5 walks, 2 strikeouts. Cade Pascale, 1 plus innings pitched, 6 runs, 7 hits, 3 walks. Cal Omohundro, 2 innings pitched, 2 runs, 1 hit, 1 walk, 3 strikeouts. Patrick Mitton, 1 for 3, hit by pitch, RBI, 2 runs. Brodie Maloney, 3 for 4, walk, 2 singles, triple, 5 RBI, 3 runs. Michael Kubiak, 1 for 3, single, walk, hit by pitch, 3 runs. Zack DeLeo, 3 for 5, 3 singles, 2 RBI, 2 runs. Ryan Graves, 3 for 4, 2 doubles, single, 3 RBI, 4 runs. Lorenzo Parra, 3 for 3, hit by pitch, walk, 2 doubles, 3 run home run, 5 RBI, 5 runs scored. Chance Womack, 0 for 1, hit by pitch twice, 2 runs. Cal Omohundro, 1 for 4, hit by pitch, single, 3 runs. Aaron Chinzi, 1 for 1, 2 walks, hit by pitch, RBI, 2 runs. Cade Pascale, 1 for 1, single, 2 RBI. Senior Bailee Piper had a big day collecting 4 hits including the 8th inning walk off winner. Limited to just 9 players due to State FFA and Avid trips, the Broncos held off a feisty Frazier Mt team. Little Eva Lent pitched 8 innings 14 hits, 4 BB, 7 K’s. Bailee Piper 4 for 5 with a triple, 4 RBI’s including the game winning RBI’s in the bottom of the 8th. Hannah Waasdorp 3 for 5 with homerun 4 RBI. Sabrina Barlow 3 for 5 with 2 doubles. Peyton Tetrick 3 for 5 with a double. Destiny Frank 2 for 4. Ashley Worley 1 for 5 with a double. Jordan Frankson 1 for 4. Alondra Ojeda, 1 for 2. Selia Amisone, 2 for 4. Corie Campbell, 2 for 4. Drew Dondero, 4 for 5. Jenna Andersen, 2 for 3. Montana McIntosh, 3 for 5. Gracie Soto, 2 for 3. Julie Cepeda, 2 walks, 2 runs. The Broncos battled high winds and the California City Ravens Tuesday. Bishop Union’s varsity squads broke open close games for easy wins while the JV girls fell 19-13. Friday the Broncos will host Frazier Mt. The three teams that played Tuesday will be back in action with the Falcons with the JV boys off until Tuesday April 26th when all 4 teams will host rival Kern Valley. Sophomore Justin Yates pitched a complete game 2-hitter. Yates held the Ravens hit-less until the 5th inning and held them scoreless until allowing an unearned run in the 6th. Yates recorded 8 strikeouts, walked 2, and hit 2. After a slow start the Bronco bats heated up with big days from Patrick Mitton, Michael Kubiak, Zack DeLeo, Ryan Graves and Cal Omohundro. The win moves the varsity to 1-1 in High Desert League play. Patrick Mitton, 3 for 5, 2 singles, triple, 3 RBI, 2 runs. Brodie Maloney, 1 for 4, single, walk, run. Michael Kubiak, 2 for 3, walk, hit by pitch, 2 runs. Zack DeLeo, 4 for 4, hit by pitch, double, 3 RBI, 2 runs. Ryan Graves, 2 for 5, 3 RBI, run. Cal Omohundro, 2 for 4, 2 runs. Lorenzo Parra, 3 walks, hit by pitch, run. Bailee Piper 3 for 3 with 2 RBI. Hannah Waasdorp 2 for 4 with a double and a homerun and 2 RBI. Sabrina Barlow 2 for 4 with a home run and 2 RBI. Jordan Frankson 2 for 3. Dulcinea “Birthday Girl” Vasquez 1 for 1. Katrina Biehl 1 for 2. Vicky Begay 1 for 3. Hayley Hersley 1 for 4. Peyton Tetrick 1 for 4. Selia Amisone started the game pitching with Drew Dondero pitching in relief striking out 4 and walking 5 batters. Cassidy Moffett, 1 for 2. Selia Amisone, 1 for 2. Drew Dondero, 2 for 2, double. Fiona Moffett, 1 for 2. Montana Macintosh, 1 for 2. Cover Photo by Lorenzo Parra. Sophomore Justin Yates vs. Burroughs. Bishop Union High Schools Varsity softball team and both Baseball teams made the trip to Ridgecrest Saturday. The JV girls softball teams field did not hold up the heavy rain Friday, and the JV girls double header was cancelled. Burroughs won all six games Saturday while the Broncos gained valuable field time in advance of High Desert League opening games Tuesday. Bishop Union will travel to Rosamond Tuesday. The Varsity boys game will broadcast live in the Bishop area on AM 1230 KBOV, and streamed live here through the listen live link. The JV Boys have picked up a game today (Monday, April 11th) hosting Trona. The JV have also added a home game with Mineral County Friday. Both California City and Frazier Mt. are no longer supporting JV boys teams. Patrick Mitton, 1 IP, 8 runs, 1 earned run, 3 hits, 2 walks, 1 strikeout. Justin Yates, 4 IP, 4 runs, 0 earned runs, 6 hits, 0 walks, 2 strikeouts. Brodie Maloney, 1 for 2. Ryan Graves, 1 for 2. Joe Mayhugh, 2 2/3 IP, 4 runs, 5 hits, 1 walk, 2 strikeouts. Cal Omohundro, 1 2/3 IP, 8 runs, 7 hits, 1 walk. Zack DeLeo, 1 2/3 IP, 4 runs, 4 hits, 2 walks, 3 strikeouts. Brodie Maloney, 3 for 4, 3 RBI. Patrick Mitton, 2 for 3, 2 runs, walk. Michael Kubiak, 1 for 3, run. Little Eva, 2 IP, 7 runs, 7 hits, 1BB, 2 K’s. Peyton Tetrick, 2 and 1/3 IP, 4 runs, 4 hits, 1 BB, 1 K.
Katrina Biehl, 2 IP, 9 runs, 7 hits, 2 BB, 1 K.
Matt Rosga, 3 1/3 IP, 6 runs, 6 hits, 2 BB, 3 strikeouts. Cover Photo by Lorenzo Parra. See more at http://www.lorenzoparra.com/#! Lone Pine Baseball and Softball made the short trip to Bishop Wednesday afternoon for a pair of games. The Golden Eagles surely enjoyed the ride home taking with them a pair of wins. Traditionally the Golden Eagles softball team plays the Bronco JV, but this year Lone Pine wanted a shot at the Bronco varsity, they responded with a 7-3 win. In recent years the baseball match up is on the schedule as a confidence booster for the Broncos heading into High Desert League play. This year the Broncos leave the Lone Pine game with more questions than answers after a 8-7 Golden Eagle win. Bishop Union held a 7-4 lead heading into the 7th inning Wednesday afternoon, but Lone Pine put a 4 spot on the board in the top of the 7th to win. Bishop Union will have one more tune up before league play. The Broncos travel to Ridgecrest Burroughs Saturday for double headers set for 11am and 1pm. Bishop Union starts HDL play on Tuesday, April 12 at Rosamond. Lone Pine continues their busy week hosting Boron Friday. Garrett Sullivan, 4 Innings pitched, 6 strikeouts, 1 run. Juan Hernandez, 1 inning, 1 strikeout, 1 run. Nicholas Dawson, 1 and 2/3 innings pitched, 3 runs. Brice Bryce, 1/3 inning pitched. Garrett Sullivan, 2 for 4, 2 triples. Ryan Cappello, 1 for 3, double. Adrian Gonzales, 2 for 4, 2 doubles. Dylan Noland, 2 for 4, single, triple. Kyler Francone, 2 for 4. Aaron Chinzi, 7 innings pitched, 9 hits, 5 strikeouts. Pattrick Mitton, 2 for 3. Ryan Graves, 1 for 3 run. Cal Omohundro, 2 for 4. Andrew Allen, 3 for 4, 2 doubles. Joe Mayhugh, 2 for 3. Lorenzo Parra, 1 for 3, double. Juliann Jones held Bishop to 4 hits and no walks in 5 innings. Jessianne Joiner, 2 for 4, triple, stolen base, RBI. Lacie Jones, 2 for 4, 1 stolen base. Katelyn Button, 1 for 3, RBI. Celia Ray, 1 for 3. Little Eva pitched 7 innings, 7 hits, 8 K’s, 4 BB’s. Sabrina Barlow, 2 for 3 with a triple. Bailee Piper, 2 for 3 with a double. Ashley Worley, 1 for 2. Haley Hersley, 1 for 3. Bishop Union High School Baseball and Softball played host to the Boron Bobcats Tuesday afternoon. The varsity games were close, hotly contested ball games while the JV contests were strong Bishop Union wins. Bronco varsity baseball dropped a one run decision with the varsity softball team winning in come-from-behind fashion, 12-10. Next up for the Bronco Varsity teams will be home games with Lone Pine Wednesday, April 6th. Hannah Waasdorp, 2 for 4 with a double. Bailee Piper, 1 for 2 with a double. Jordan Frankson, 1 for 2 with a double. Cienna Martinez, 1 for 1. Ashely Worley, 1 for 3. Destiny Frank, 1 for 2. Coach Patty Cummings reports that Freshman Drew Dondero connected on a grand-slam highlighting Bishop Union’s big offensive day. Next up for the JV girls will be a trip to Burroughs on Saturday, April 9th. Bishop Union dropped a one run decision to the Bobcats Tuesday. The loss moves the Broncos record to 4-4-1 on the season. Coach Chris Walston praised the pitching effort of Aaron Chinzi, Justin Yates, and Zack DeLeo. Next up for the Bronco Varsity will be a home game with Lone Pine Wednesday, April 6th. The first Bronco Broadcast on KBOV and here on KIBSKBOV.COM is set for Tuesday, April 12th when the Broncos travel to Rosamond opening High Desert League play. The Bronco JV were down 1-0 after the first inning but put together 22 runs on 22 hits in the next three innings earning the 22-5 mercy rule win. The Bishop Union JV will travel to Boron Tuesday, April 5th for a double header with the Bobcats. Game times are set for 1 and 3pm. Winning pitcher, Cade Pascale, 3 innings pitched, 3 runs, 2 hits, 7 strikeouts. Matthew Rosga, 1 inning pitched, 0 runs, 2 strikeouts. Hunter Beall, 1 inning pitched, 2 runs, 2 hits, 1 walk, 2 strikeouts. Mark Mayhugh, 3 for 5, double, 2 RBI, 3 runs. Matt Rosga, 3 for 5, 2 doubles, 4 RBI, 3 runs. Jalen Watterson, 2 for 5, RBI, 2 runs. Hunter Waasdorp, 3 for 4, walk, RBI, 2 runs. Hunter Beall, 2 for 4, walk, RBI, 2 runs. Austin Thomas, 1 for 3, walk, Run. Brady Womack, 1 for 2, 2 RBI, Run. Christian Landeverde, 2 for 2, RBI, 2 runs. Lukas DiAngelo, 1 for 2, wall, hit by pitch, 4 Runs, RBI. Bishop Union High School softball won their first 3 games at the Yerington Tournament before falling in the finale to the host team. Bishop Union improves their record to 4-5 and will have a break in action until Tuesday, March 22nd when they play host to Boron. The Bishop Union Junior Varsity finished action in Yerington with a 2-2 record. Little Eva Lent pitched 6 innings, 3 runs, 6 hits, 11 K’s, 3 BB. Vicky Begay 1 for 1 with a double and 2 RBI. Cienna Martinez 1 for 1 with a RBI. Bailee Piper 1 for 1. Peyton Tetrick 3 for 4. Hannah Waasdorp 2 for 3 with a double. Sabrina Barlow 1 for 3. Katrina Biehl pitched 3 innings, 0 runs, 0 hits, 3 K’s, 2 BB. Peyton Tetrick pitched 2 innings 0 runs, 0 hits, 2 K’s, 2 BB. Jordan Boxley 2 for 2 with a double. Vicky Begay 2 for 3 with 3 RBI. Jordan Frankson 1 for 2 with a triple. Bailee Piper 1 for 3 with a grand slam. Peyton Tetrick pitched 2 innings, 0 runs, 0 hits, 4K’s, 2 BB. Katrina Biehl pitched 3 innings, 0 runs, 0 hits, 4 K’s. Sabrina Barlow 3 for 3 with 3 RBI. Topah Scherer 1 for 1 with a RBI. Destiny Frank 2 for 3. Vicky Begay 1 for 3 with a double. Ashley Worley 1 for 2. Jordan Frankson 1 for 2. Bailee Piper 1 for 3. Little Eva Lent 1 for 3. Little Eva Lent pitched 6 innings 5 runs, 7 hits, 1 K, 3 BB. Sabrina Barlow 2 for 3. Hannah Waasdorp 1 for 3. Peyton Tetrick and Bailee Piper both walked and scored. Coach Patty Cummings notes that the JV finished the Yerington Tournament with a 2-2 record moving their overall record to 5-2. Bishop Union’s JV notched wins over Yerington and Sparks and fell to Fernley and Lowry. On the weekend Drew Dondero was 3 for 9 with a homerun and a double scored 4 runs. Selia Aminsone 4 for 10 scored 4 runs. Gracie Soto 1 for 7 scored 3 runs. Sam Marcinko 3 for 8 scored 2 runs. Morningstar Lent 6 for 8 scored 4 runs. Faith Manriquez 1 for 7 scored 1 run. Julie Cepeda 1 for 2 scored 1 run. Montana McIntosh scored 1 run. Cassidy Moffett 1 for 4. Pitching for the Bronco JV, Selia Amisone struck out 3 and walked 6 and Sam Marcinko struck out 8 walked 4. The Bronco Varsity Baseball team opened the 2016 campaign with a 12-1 win at Bakersfield South High School. Three Bronco pitchers combining for a no hitter. Junior Patrick Mitton started the ball game throwing 3 quality innings striking out four while allowing no hits or walks. Junior Andrew Allen then entered the game tossing two innings striking out three Rebels. Senior Zack DeLeo finished the game off with a strong final inning allowing 1 unearned run while striking out two. The Bronco Offense packed their hitting shoes for Bakersfield knocking out 18 hits. Ryan Graves put together a strong opening day going 3 for 5 with double and a triple driving in a run. Graves, a junior, made his return to Bronco baseball after a two year hiatus. Starting pitcher Patrick Mitton also had a big day at the plate going 5 for 5 with a triple and a RBI. Sophomore Catcher Brodie Maloney, Zack DeLeo, and Freshman Cal Omohundro all had multiple hit games. WP-Patrick Mitton, 3IP, 4 ks, 0 runs, 0bb, 0 hits. Andrew Allen, 2 IP, 3 ks, 0 runs, 1bb, 0 hits. Zack DeLeo, 1 IP, 2 ks, 1bb, 1 run (unearned), 0 hits. Ryan Graves, 3/5, dbl, triple, 1 rbi. Patrick Mitton, 5/5, 1 triple, 2 rbi. Brodie Maloney, 2/4, double, 3 rbi. Zack Deleo, 3/4, double, 3 rbi. Aaron Chinzi, 1/3, 2 rbi. Next up for Bishop Union will be a trip to Yerington for a weekend tournament. 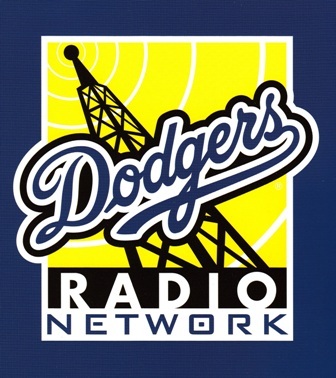 Reminder that AM 1230 KBOV will air Bronco High Desert League games beginning with the HDL opener on April 12 at Rosamond. The Bronco JV opened up a 6-0 first inning lead and cruised to victory 10-5. Sophmores Trace Sapp and Justin Yates led the way. WP, Justin Yates, 3IP, 8k, 3h, 2bb, 2 runs. Hunter Beal, 1IP, 3k, 2h, 3bb, 2 runs. Cade Pascale, 1IP, 1k, 1h, 1run. Trace Sapp, 3/4, RBI, 2 runs, 2sb. Cade Pascale, 1/2, 2bb, 2rbi, 2runs, 2sb. Hunter Beall, 1/3, Dbl, 2rbi. Lukas DiAngelo Zaragoza, hbp, run. Next up is the Yerington tournament this weekend. Little Eva Lent pitched 5 innings. 8BB’s, 3 K’s, 3 hits. Cienna Martinez 2 for 3 with a triple and 2 RBI. Peyton Tetrick 2 for 4. Bailee Piper 1 for 2 with 2 RBI. Little Eva Lent 1 for 4 with 2 RBI. Vicky Begay had an unassisted double play at third. The Bronco JV improve to 3-0 with a strong win at Bakersfield. Next up is trip to Yerington.